After removing the displays, iFixit uncovered a few differences with the iPhone XS Max compared to the iPhone XS, including a resized Taptic Engine and an extended logic board, with one of the display connectors moved to the bottom. It appears the iPhone XS Max also has a slightly louder earpiece for phone calls. 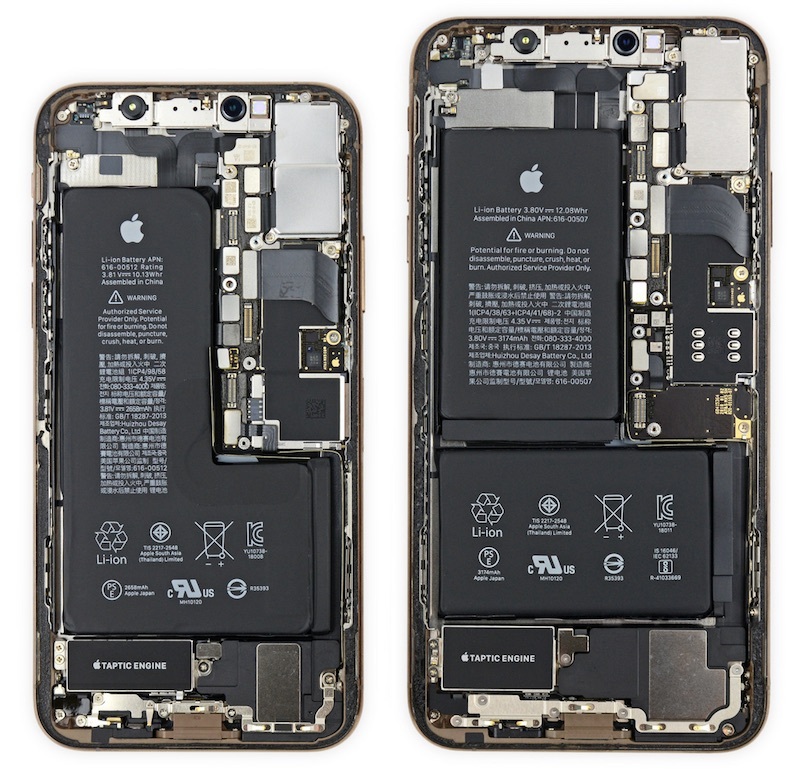 Since the L-shaped batteries have six sides, rather than four like a rectangle, iFixit says Apple has "notched" the internal corners of the batteries in the iPhone XS to prevent undue stress from thermal expansion. "This dramatic shift opens up a lot of design possibilities, but the large notch is responsible for the decrease in capacity relative to the X," its teardown email says. "Only time will tell how this new cell performs with age." iFixit confirms the wide-angle sensor size has been increased by 32 percent in the iPhone XS and iPhone XS Max. Pixel size has also been bumped, providing better low-light performance and contributing to the new "Smart HDR" feature. iFixit gives the iPhone XS and iPhone XS Max an overall repairability score of 6/10, with 10 being a perfect score. The repair experts say display and battery repairs remain a priority in the iPhone's design, but the all-glass design means the entire chassis must be replaced if the back glass cracks. 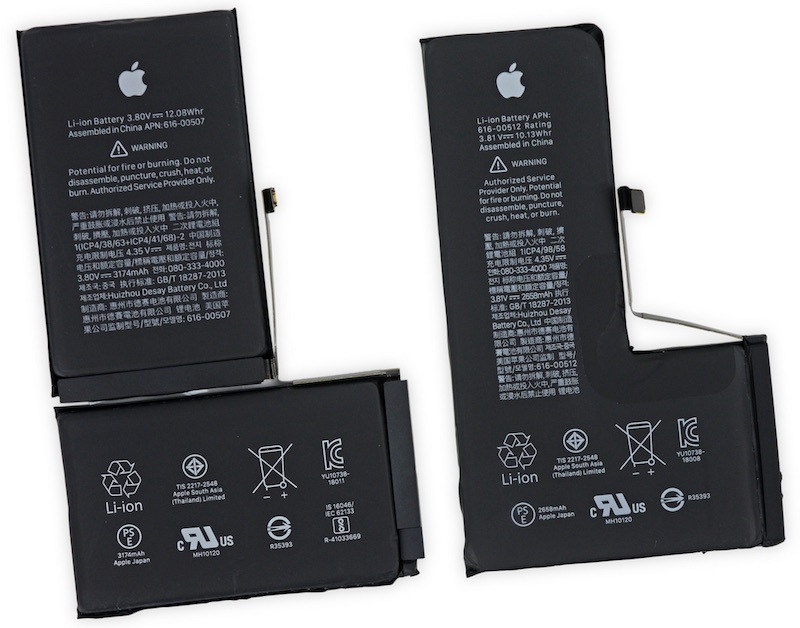 Update: A previous version of this article said both the iPhone XS and iPhone XS Max have "notched" battery designs, but iFixit says this is only true for the iPhone XS. The article has been corrected. I wouldn't call the rounded corners a "notch". I believe this is the notch ifixit is talking about. What kind of monster tears the phone down before turning it on and taking a bunch of screenshots from the Field Test app? Too bad Apple never specifies the sensor size in their technical specifications. Would make the Xs camera stand out more. As it is currently, people might think there weren’t many improvements. Are you referring the the “30% larger.....” that they spoke about in the keynote? Yes it does, they use Intel modems. Did you read the breakdown? They said Publicly that the wide angle sensor went from 1.2micron pixels to 1.4. Right, but bigger pixels+same number of pixels=bigger sensor size. Pixels growing 1.2u—>1.4u is >30% larger. Apple stated something like 32% larger sensor size to Gruber iirc. Obviously they didn't, as usual.